A pole star is a visible star, preferably a prominent one, that is approximately aligned with the Earth's axis of rotation; that is, a star whose apparent position is close to one of the celestial poles, and which lies approximately directly overhead when viewed from the Earth's North Pole or South Pole. A similar concept also applies to other planets than the Earth. In practice, the term pole star usually refers to Polaris, which is the current northern pole star, also known as the North Star. The identity of the pole stars gradually changes over time because the celestial poles exhibit a slow continuous drift through the star field. The primary reason for this is the precession of the Earth's rotational axis, which causes its orientation to change over time. If the stars were fixed in space, precession would cause the celestial poles to trace out imaginary circles on the celestial sphere approximately once every 26,000 years, passing close to different stars at different times. The stars themselves also exhibit proper motion, which causes a very small additional apparent drift of pole stars. 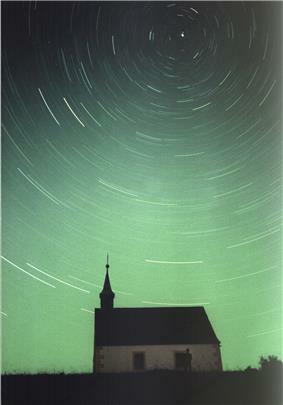 Time-lapse video of Polaris and neighboring stars. The closest bright star to the north celestial pole is Polaris. At magnitude 1.97 (variable), it is the brightest star in the Ursa Minor constellation (at the end of the "handle" of the "Little Dipper" asterism). As of October 2012 its declination is +89°19′8″ (at epoch J2000 it was +89°15′51.2″). Therefore, it always appears due north in the sky to a precision better than one degree, and the angle it makes with respect to the true horizon (after correcting for refraction and other factors) is equal to the latitude of the observer to better than one degree. It is consequently known as Polaris (from Latin stella polaris "pole star"). It was formerly sometimes known as Cynosura, from a time before it was the pole star, from its Greek name meaning "dog's tail" (as the constellation of Ursa Minor was interpreted as a dog, not a bear, in antiquity). A common method of locating Polaris in the sky is to follow along the line of the so-called "pointer" stars in the bowl of the Big Dipper asterism, specifically, the two stars farthest from its "handle". The arc between the pointer stars and Polaris is nearly five times greater than the arc between the pointer stars. 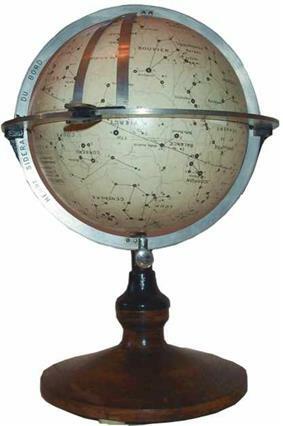 The North Star has historically been used for navigation since Late Antiquity, both to find the direction of north and to determine latitude. Due to the precession of the equinoxes (as well as the stars' proper motions), the role of North Star passes from one star to another. In 3000 BCE, the faint star Thuban in the constellation Draco was the North Star. At magnitude 3.67 (fourth magnitude) it is only one-fifth as bright as Polaris, and today it is invisible in light-polluted urban skies. During the 1st millennium BCE, β Ursae Minoris was the bright star closest to the celestial pole, but it was never close enough to be taken as marking the pole, and the Greek navigator Pytheas in ca. 320 BCE described the celestial pole as devoid of stars. In the Roman era, the celestial pole was about equally distant from α Ursae Minoris (Cynosura) and β Ursae Minoris (Kochab). α Ursae Minoris was described as ἀειφανής "always visible" by Stobaeus in the 5th century, when it was still removed from the celestial pole by about 8°. It was known as scip-steorra ("ship-star") in 10th-century Anglo-Saxon England, reflecting its use in navigation. The name stella polaris has been given to α Ursae Minoris since at least the 16th century, even though at that time it was still several degrees away from the celestial pole. Gemma Frisius determined this distance as 3°7' in the year 1547. Gamma Cephei (also known as Alrai, situated 45 light-years away) will become closer to the northern celestial pole than Polaris around 3000 CE. Iota Cephei will become the pole star some time around 5200 CE. First-magnitude Deneb will be within 5° of the North Pole in 10000 CE. When Polaris becomes the North Star again around 27800 CE, due to its proper motion it then will be farther away from the pole than it is now, while in 23600 BCE it was closer to the pole. Series of shots where you can see the rotation of the Earth's axis relative to the south celestial pole, clearly see the Magellanic Clouds and the Southern Cross. Near the end of the video you can see the rise of the moon that illuminates the scene. The Celestial south pole is moving toward the Southern Cross, which has pointed to the south pole for the last 2,000 years or so. As a consequence, the constellation is no longer visible from subtropical northern latitudes, as it was in the time of the ancient Greeks. Around 2000 BCE, the star Eta Hydri was the nearest bright star to the Celestial south pole. Around 2800 BCE, Achernar was only 8 degrees from the south pole. In the next 7500 years, the south Celestial pole will pass close to the stars Gamma Chamaeleontis (4200 CE), I Carinae, Omega Carinae (5800 CE), Upsilon Carinae, Iota Carinae (Aspidiske, 8100 CE) and Delta Velorum (9200 CE). From the eightieth to the ninetieth centuries, the south Celestial pole will travel through the False Cross. Around 14000 CE, when Vega is only 4 degrees from the North Pole, Canopus will be only 8 degrees from the South Pole and thus circumpolar on the latitude of Bali (8 deg S). Alpha Pictoris is the south pole star of Mercury, while Omicron Draconis is the north star. 42 Draconis is the closest star to the northern pole of Venus. Eta¹ Doradus is the closest to the south pole. Delta Doradus is the south pole star of the Moon. Delta Octantis is the south pole star of Saturn. Eta Ophiuchi is the north pole star of Uranus and 15 Orionis is its south pole star. In Japan, the Pole Star was represented by Myōken Bosatsu (妙見菩薩). In the Greek Magical Papyri the Pole star was identified with Set-Typhon, and given authority over the gods. In Hindu mythology, the pole star is called Dhruva. In Hawaiian mythology, the pole star is called Kiopa'a. In Chinese mythology, Emperor Zhuanxu is mentioned as a god of the Pole Star. ^ Kepelino's Traditions of Hawaii, by Kepelino, ca 1830-ca 1878. Beckwith, Martha Warren, 1871-1959.